Education has long been enough of an ideological battleground for there to have been philosophies which have developed their own mythologies. A further factor in the promotion of myths for teachers is the fact that before the internet much false information was transmitted through photocopied sheets and teaching had particularly good access to copiers and printing machines. As a result there are many teaching myths repeated to students by education lecturers, transmitted around the internet, or simply quoted as fact by teachers who should know better. Since then I’ve encountered a few more dubious claims repeated as facts in educational debate, again and again and again. Myth 1: The Top Ten in Demand Jobs in 2010 did not exist in 2004. For many, school is still a place where you go to have your head filled with ‘certainties’, a core knowledge base which grows increasingly irrelevant to the world we live in. According to New Brunswick Department of Education, Canada, the top 10% of jobs last year didn’t exist in 2004! Is the best way to prepare our youngsters for this level of uncertainty to continue feeding them a diet of shallow learning experiences dictated by political presumption? According to former Secretary of Education Richard Riley . . .The top 10 in-demand jobs in 2010 didn’t exist in 2004. 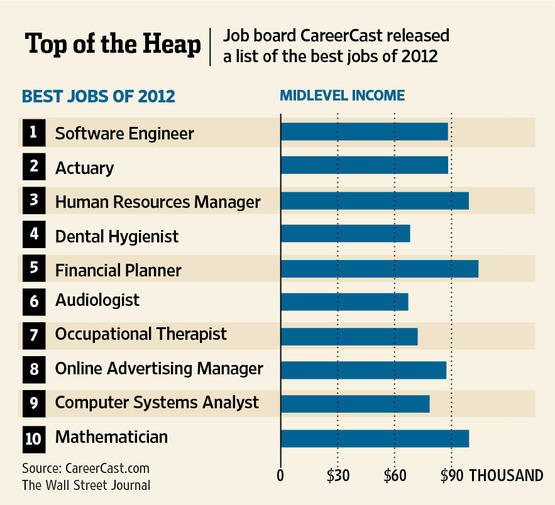 It is estimated that the top 10 in-demand jobs of 2010 did not exist in 2004. We are currently preparing students for jobs that do not exist! The 21st Century is a fast moving place. With the evolution of our society and the rapid growth of new technologies, the young learners of today face new challenges on a global stage. As teachers, it is our aim is to prepare students so they can be successful in the modern-day world and workplace, however with a curriculum and lesson structure that dates back to the 19th Century, can we really be expected to do this effectively? In the 2007-2010 period, the top ten occupations with the highest total number of new jobs demanded are forecast to be (in order) retail salespersons, financial auditors and accountants, retail trade managers, information systems analysts and consultants, general office clerks, petroleum engineers, geologists geophysicists and geochemists, computer programmers, restaurant and food managers, and administrative officers. Of course, these lists aren’t telling us anything that two seconds of thought wouldn’t already tell us, Without serious research, could you name 10 occupations which didn’t exist in 2004? There must be some; there may well be new occupations dealing with 3D cinema technology, or treating people for addiction to Twitter, but there is no reason to think these occupations are the most “in demand” in any way. The claim is absurd. There is also an additional irony in that it is people who are complaining that teachers pass on facts without encouraging critical thinking, who are themselves uncritically passing on this false information as fact. While this list includes less traditional jobs than the others it still falls far short of identifying any jobs which could reasonably be considered to have appeared between 2004 and 2010. One of the first things I learned when I became the Shadow Culture Minister was that 60% of the jobs that my three children (aged 9, 7 and 2 months) will go on to work in have not yet been invented. Dan Jarvis MP on the Labour Teachers blog. There is an established piece of knowledge peddled around the educational conference circuit that says that 60% of all the jobs that young people in school today will do have not yet been invented and more importantly, they are going to have to invent those jobs. And this feature on an academic website which attributes the claim that “60% of 11 year olds will leave school to do jobs which have not yet been invented” to “Collard, P (2008) Key Note Address to conference CITE (Creativity in Initial Teacher Education ), 4/03/2008, Chorley”. I have been unable to find this source online but it would appear that this myth is being spread by educationalists at conferences. You get the picture. Again, these companies generate a greater amount of employment and revenue indirectly, but still our major innovations are springing up in sectors where a lot of work is done by machines, not by human beings. A recent study found that the iPod— a nearly ubiquitous device— has created 13,920 jobs in the United States, including engineering and retail. That’s a pretty small number. Again, we should applaud the iPod for creating so much value with so little human labor, but again you can see that a lot of our innovation but again you can see that a lot of our innovation has a tenuous connection to revenue. Note, by the way, that digital music has eliminated many jobs in the music industry, as listeners buy single songs (or obtain the music illegally) rather than purchasing entire albums. The 13,920 figure doesn’t count those lost jobs at all, and arguably the iPod has had only a very small net positive impact on job creation. Update August 2012: I have now discovered here and here yet another variation: “65% of todays grade school kids will end up at a job that hasnt been invented yet.” The source given is “United States Department of Labor: Futurework – Trends and Challenges for Work in the 21st Century” which refers to a report from 1999 which does not contain any such claim. Myth 2: Researchers at Cambridge have shown that the order of letters is unimportant in reading. Cdnuolt blveiee taht I cluod aulaclty uesdnatnrd waht I was rdanieg. The phaonmneal pweor of the hmuan mnid. Aoccdrnig to rscheearch at Cmabrigde Uinervtisy, it deosn’t mttaer in waht oredr the ltteers in a wrod are, the olny iprmoatnt tihng is taht the frist and lsat ltteer be in the rghit pclae. The rset can be a taotl mses and you can sitll raed it wouthit a porbelm. Tihs is bcuseae the huamn mnid deos not raed ervey lteter by istlef, but the wrod as a wlohe. Amzanig huh? yaeh and I awlyas tghuhot slpeling was ipmorantt! 2) It is not actually true in general; the text has been designed to be fairly easy to read when jumbled. Further information can be found here. To ‘Educate’ means to ‘Lead Out’…The word educate does not mean: to fill up with facts, the original meaning of the word educate comes from the Latin e-ducere meaning “to lead out”. In education one is meant to light an urge in each person, to become human! The rest is up to that person. The original meaning is: to draw out. To educate means to draw out; whatsoever is hidden in the individual has to be drawn out. The individual has to flower — that is the original meaning of education. The Latin etymology of the English word, “educate” means “to lead out”. This means to guide or direct what is inside to a place outside. Apparently, within an educational process, this would mean to help a student to go inside himself/herself and externalize the wisdom that already resides within. This is another claim used to justify dumbing-down; this is an old classic and, although I have picked internet examples, I could have found examples throughout the last hundred years of progressive education literature. The suggestion is that, if educating means leading out, then teachers need only allow students to uncover something internal (motivation, self-esteem, interest or whatever) rather than to actually teach them any knowledge or exert any external authority over the child. The Latin word ‘educere’ was usually, though not always, used of physical development. In Silver Latin ‘educare’ was used of the rearing of plants and animals as well as children. In English the word ‘education’ was originally used to just to talk in a very general way about the bringing up of children and animals. In the seventeenth century, for instance, harts were said to delight in woods and places of their first education. The word was often used of animals and birds that were trained by human beings such as hounds and falcons. In the nineteenth century it was even used of silkworms. Cowen, Tyler (2011-01-25). The Great Stagnation: How America Ate All The Low-Hanging Fruit of Modern History, Got Sick, and Will (Eventually) Feel Better: A Penguin eSpecial from Dutton (Kindle Locations 97-102). Penguin Group. Kindle Edition. I have often heard ‘We need to teach students to think,” but after looking at the curriculum I have been left with the question, “Think about what?” There are literally 100,000s of high paying unfilled jobs in the US, because there are not enough qualified applicants. Perhaps they were being prepared for the careers of the future. I don’t necesarily believe that there are all sorts of jobs that there aren’t enough qualified applicants to fill, I’d be curious to see the research for this. I do believe that there aren’t enough people willing to do the work that some companies want for a pittance. I think there are big flaws in the arguments presented in these articles. The main feature in a lot of this seems to be people don’t have training, and the employer isn’t willing to spend much of its money to make up the difference. Why would someone risk debt to train for a position that may not be open any longer when they finish? If you can’t find someone qualified you’d think they’d do the training of people who were promising in other areas. Argh! My daughter told me this morning that at the end of term assembly her headmaster (it’s that sort of school) told the children that half the jobs they would be doing hadn’t been invented yet. The 65% of grade school kids will work in jobs which haven’t been invented yet claim comes from Cathy Davidson’s book. She cites an article citing the US Dept of Labor report but as you mention, it’s not in the report. I’ve emailed her asking for the correct source but haven’t heard back. I’d add another to your list – the existence of learning styles. There are, in extreme cases, people who think in different ways (temple grandin being a visual thinking is a great example), but the idea that all learners can be put into a category of Visual, Auditory or Kinaesthetic has no science behind it whatsoever, but still gets repeated all the time in professional development sessions. Thank you for clearing up the myth #1 – I’ve spent a good deal of time trying to find the original source for this “65% of grade school kids…” (I wanted to quote it in my PhD study – but without a proper reference it is impossible). It is not, as you wrote in the Future Report of US Labor Department – I’ve read it through and used the search function as well. It is an interesting quote I came across in a conference in Finland this spring. Irritating how apparent truths are spreading around.